ROANOKE, Va. – The Hotel Roanoke & Conference Center, Curio Collection by Hilton and The Regency Room restaurant at the historic property, have been awarded the esteemed AAA Four Diamond Designation Rating for lodging and restaurants. The hotel is part of the exclusive Curio Collection by Hilton, a global portfolio of upper upscale, one-of-a-kind hotels and resorts all celebrated for their individuality. “We are honored to receive the coveted AAA Four Diamond Rating for both the hotel and The Regency Room,” said Brian Wells, general manager of The Hotel Roanoke & Conference Center, Curio Collection by Hilton. "The importance and responsibility of representing Virginia’s Blue Ridge to our visitors and guests is an honor and the AAA Four Diamond designation affirms our commitment. It&apos;s a source of tremendous pride for our entire team." For more than 80 years, AAA has used professional inspectors to conduct in-person property inspections. Just 6.1 percent of the more than 27,000 AAA Inspected & Approved hotels make the Four Diamond list. The company’s team of inspectors assesses each of the eligible properties based on comfort, cleanliness, security and available services and amenities. With a far greater inventory than any other rating entity, AAA’s rating system covers the United States, Canada, Mexico and the Caribbean. The historic downtown property is among only a few properties in Virginia to earn the AAA Four Diamond Rating, achieved by hotels which employ experienced, highly-qualified staff to provide the customer service discerning hotel guests expect. These establishments deliver unmatched guest comfort with extraordinary accommodations, facilities and personalized amenities. Continuing its commitment to preserving the traditional look of the unique and historic hotel while adding the modern features today’s meeting and event planners expect, the hotel underwent a comprehensive multi-million dollar renovation and redesign that began in 2017 and included updates to the lobby, conference spaces and public areas. The hotel is also slated to open a new coffee shop called Steam by the end of spring 2018. In February 2016, The Hotel Roanoke & Conference Center joined Curio Collection by Hilton, an upper upscale, global portfolio of more than 50 one-of-a-kind hotels and resorts handpicked for their unique character. In 2017, the hotel was awarded the Curio Collection by Hilton Award of Excellence, honoring the brand’s best hotels excelling in four key areas, including quality assurance audits measuring cleanliness and property condition, customer scores rating staff service and guest loyalty. 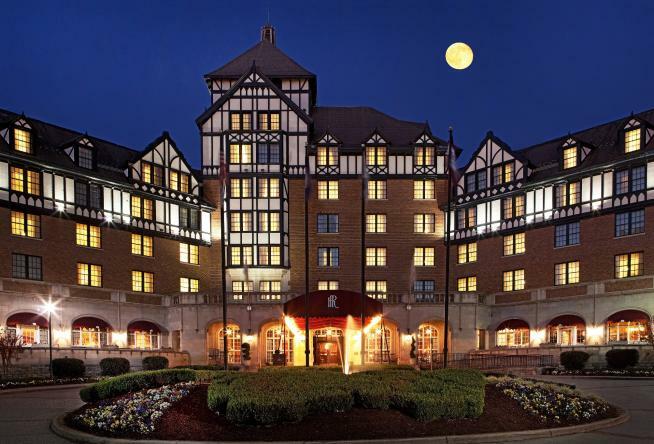 To learn more about The Hotel Roanoke & Conference Center, Curio Collection by Hilton and The Regency Room, please visit http://curiocollection3.hilton.com/the-hotel-roanoke-and-conference-center-curio-collection-by-hilton-ROACUQQ/index.html. Designated as a National Historic Landmark, The Hotel Roanoke & Conference Center, Curio Collection by Hilton has 330 upper upscale guestrooms and a 63,000-square-foot, high-tech conference center. It is a joint project of Hotel Roanoke LLC, the City of Roanoke and Virginia Tech. Curio Collection by Hilton (curiocollection.com) is an upper upscale, global portfolio of more than 50 one-of-a-kind hotels and resorts handpicked for their unique character. Curio Collection properties appeal to travelers seeking unexpected and authentic experiences, and the benefits of Hilton’s award-winning guest loyalty program, Hilton Honors. Read the latest brand and property stories at news.curiocollection.com; discover Curio Collection destinations through the eyes of locals with 48-hour itineraries at citiesbycurio.com; and connect with Curio Collection on facebook.com/curiocollection, instagram.com/curiocollection and twitter.com/curiocollection. Benchmark Hospitality International® is a recognized global leader in the management and marketing of resorts, hotels and conference centers. The company’s two distinctive portfolios of properties, Benchmark Resorts & Hotels® and Personal Luxury Resorts & Hotels®, represent the finest in guest-dedicated hospitality in unique destinations across the United States, in the Caribbean and Japan. Benchmark Conference Centers® maintain the highest standards for certification in meeting excellence. Benchmark Hospitality was launched in 1980 as an independent company and today operates worldwide from offices in The Woodlands (Houston), Texas, and regional offices in New Jersey, Washington State, Japan and Chile. For additional company information visit benchmarkhospitality.com. To become a fan on Facebook, visit facebook.com/BenchmarkResortsandHotels, or follow us on Twitter at twitter.com/BenchmarkHotels.